Tip number 1 – Have a support network. By this I don’t just mean emailing your mum once every three months to let her know your alive, I mean an on-ground support network, as well as your family and friends back home. When I arrived in Japan I was met by two wonderful people who have been my main support here. One helps with work issues, the other with life issues. The two of them helped me find my feet in Japan a lot faster than if I had to figure it out on my own. Keeping in close contact with them has been essential, because they are my first port of call if anything happens to go wrong, or if I need help. Some of the things they have helped me with include; getting a few more days of holidays, helping work out my bin schedule, translating my mail, organising my apartment and helping when I crashed my bike badly. Without these two, I probably wouldn’t have lasted this long in Japan. I would have given it all up as too difficult and gone running home with my tail between my legs (metaphorically because I’m not a quitter). I do also make sure to keep in regular contact with my parents and friends. It helps with homesickness and helps ensure they don’t forget how awesome I am. I live in the smallest city in the Hyogo Prefecture, Japan, and my city still has an international association. A quick google (or maybe even Facebook) search should tell you where the closest one is to you. These associations provide support with everyday problems, like organising a bank account, and also can provide language lessons and fun outings. Definitely worth checking out even if you don’t need the help. This might be your boss of even just a colleague. At times these people might seem to be really busy, and they probably are, but trust me, they will help if you ask. Helping you out might be the distraction they need from their boring 9 to 5 job. This again isn’t for everyone, but you might find in your first few days a neighbour will come over and introduce themselves. I have a neighbour who randomly comes over and gives me radishes. I don’t really know how to cook radishes, but his visits always brighten my day. You’re going to be presented with a lot of opportunities, especially if you’re living in a small area without a lot of foreigners. My suggestion is to say yes to as many of these as possible. Some of them are going to sound super exciting, some of them you’ll be apprehensive about, but these opportunities are one of the best ways to meet new people and experience new cultures. For me saying yes to everything has led me to dressing up as Alice in Wonderland for Halloween and experiencing my 15 minutes of fame. 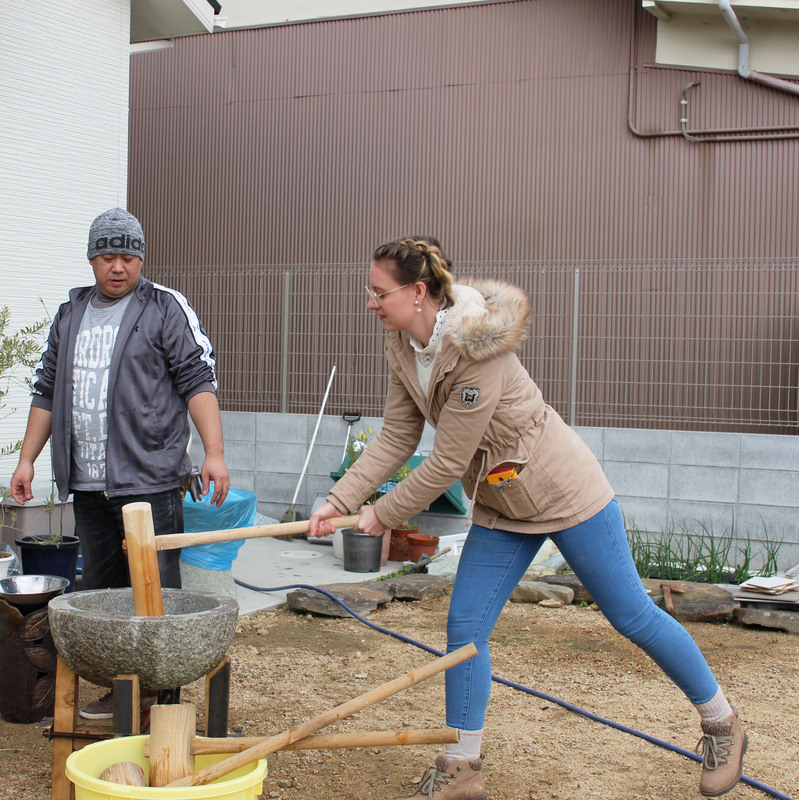 It has also had me staying with a lovely family for a few nights over New Year’s, pounding mochi, making traditional food and experiencing a real Japanese celebration. If I wasn’t so open to trying new things, I would never have developed these sick upper arm muscles from pounding that rice to make mochi, which leads me to my next tip. Tip number 3 – Embrace the Culture. This is a hard one, especially when the culture is so jarringly difference from your own, but it is doable. Embracing the culture involves a few steps, from the language, to the food, to the working system, to everyday life. After 6 months, I have done my best to adapt and embrace to the Japanese culture, but it’s definitely the one I struggle with the most. This is the easiest thing to embrace, but the hardest thing to learn. It’s easy to embrace because it’s all you’ll be hearing, reading and seeing. Therefore, you’ll want to know what’s going on. Unfortunately, there’s no easy to go about learning a language, apart from doing the hard slog. If you know where you’ll be moving, I highly suggest doing some language study before you get there, even if it’s just learning the base alphabet system. If you arrive last minute like I did, try your best to attend language lessons or do some studying in your free time. Of course, you can always take the easy way out and rely on google translate, but honestly the society you’re trying to join will allow you to integrate much faster if you can speak their language. This one is easy. Try everything put in front of you, just like your mummy and daddy told you to do when you were 3. If you don’t like something, remember the name and don’t eat it again, simple. If you do happen to miss the food from home, which you will, learn to cook. Just remember the kitchen equipment might be different than you’re used to, so you’ll have to adapt to that too. The Japanese people work long hours, and never seem to take a break. I’ve known Japanese people who, when they are forced to take a holiday, go to work anyway because they don’t know what else to do with their time. You’ll likely be expected to work these crazy hours too, after all you’re here to work, not to party. However, this is the only cultural practice I say you can rebel against a little. If you don’t feel your time is being used wisely, tell someone. There’s no point in being paid to be at work when you’ve literally got nothing to do, it’s a waste of your time and your employees money. It’s much better for you to experience the wonders of Japan than be stuck behind a desk, so make sure you tell your bosses that! Heated toilet seats, five different types of rubbish separation, public transport etiquette, the magical of combini’s, Japan, at least, has a billion everyday things to get used to. The best way to get used to them is through observation and asking questions. Now I don’t recommend peeping over the toilet stall to see all those magic buttons at work, but I do suggest pressing every button once just to see what they do. The best way to learn about everyday life is by doing, so don’t lock yourself away from the world when you arrive at a new place, get out there, explore and make the most of it. The worst thing you’ll deal with in a new country, after the first few weeks of digestive issues while getting used to the new diet, is the loneliness. I’ll be the first to admit I am the worst when it comes to making Japanese (or really any) friends here. I can count on about two fingers, the number of true friends I’ve made in my time here, most of which goes back to the issue of the Japanese work culture. This is why I suggest you find some hobby or sport you really enjoy, and join a team for it. I love martial arts and have been keen to learn how to use a sword for a very long time. Therefore, one of my first priorities in Japan was finding a Japanese sword class. I’ve now been training in Iaido for about 3 months now, and it’s something I look forward to each week. Although the majority of my classmates are older, they’re lovely and welcoming, and they have improved my language skills and ninja badassery by a million-fold. 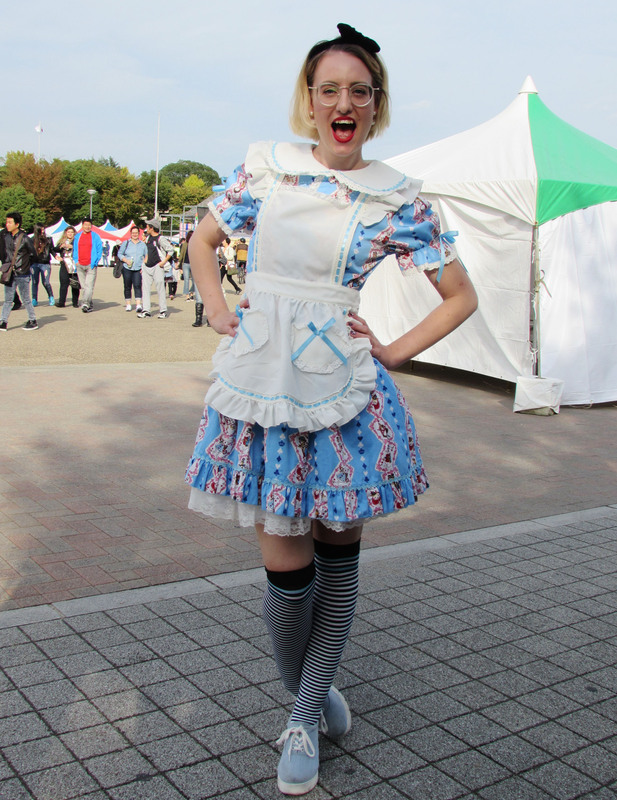 Everyone is going to ask you about what your life is like, if you love Japan and, if you watch anime. The automatic response is great, I LOVE japan, and, does Sailor Moon count? But internally you might be saying; Eh no, the Japanese society is fundamentally flawed, because I’ve lived here for a while now, I can tell you Japan is not all sunshine and butterflies. Yes, I enjoy my life here and recognize the privilege I have at being able to live overseas, but no, my life is not the rosy picture you’re imagining it to be. The first response is what people want to hear, but since when is the world about everyone else. Sometimes, just sometimes, it can be about you and what you’re feeling. Of course, if you don’t want the lengthy explanations that will follow this declaration, feel free to stick with the stock standard response. However, I do highly recommend telling your friends and your family your true feelings because it’s never good to keep these things bottled up. If you do, they’re likely to manifest into extreme negative feelings about the places you’re living and you’ll start to hate your life there. Oh also, if another person asks me if I watch anime, I might actually explode from repeating my bottled-up stock standard answer, so here is the real answer. No, I don’t. The only anime I’ve ever really watched is Sailor Moon, as yes, I loved it. But no, the reason I came to Japan I not because I am anime obsessed. Is it so hard to believe I came to Japan because it was an awesome opportunity and I had an interest in the history of the place? That and because I really want to be a ninja? Phew, so glad to have finally gotten that off my chest and to finish this guide off on such a high. So, there you have it, Melissa’s Guide to Transitioning to Life Overseas. Have you made the plunge and lived overseas before? What were some of the things that made your first few weeks or months in said foreign country, a little easier?